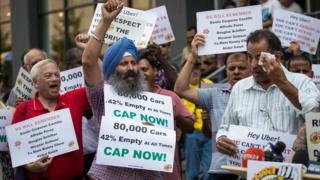 Image caption The New York Taxi Workers Alliance has described it as a "historic victory"
New York has become the first major US city to approve a cap on ride-hail car licences and set minimum pay conditions for drivers. The bill will impact popular app-based services like Uber and Lyft, who have both spoken out against it. Yellow cab drivers and anti-congestion campaigners have pushed for regulation after the number of app-based cars soared in recent years. About 80,000 now operate throughout the city, versus just 13,500 yellow cabs. Taxi drivers demonstrated in support of the bill outside the headquarters of the New York City Taxi and Limousine Commission (TLC) this week, holding signs with the names and faces of six taxi drivers who had taken their lives since December. Campaign and union groups directly linked the financial pressures caused by the growth of ride-hail car services to the driver suicides. The bill passed on Wednesday approves a year-long moratorium on new ride-hail vehicle licences for 12 months, with the exception of wheelchair accessible cars. The legislation was supported by New York Mayor Bill de Blasio, who said it would help "stop the influx of cars" causing congestion in the city. However, ride-hail services have criticised the bill and argued it will hurt consumers. Uber said in a statement: "The city's 12-month pause on new vehicle licenses will threaten one of the few reliable transportation options while doing nothing to fix the subways or ease congestion." Lyft said the move would "bring New Yorkers back to an era of struggling to get a ride, particularly for communities of colour and in the outer boroughs." New York is the biggest US market for app Uber. A study last month estimated that app-based drivers now complete over 17 million trips a month in New York. The study, commissioned for the TLC, recommended a minimum hourly wage for drivers of $17.22 per hour - and found that 85% of app-based drivers currently net below that amount. The New York Taxi Workers Alliance celebrated the vote, describing it on its website as a historic victory for its 18,000-member strong union.